If you've been using the Safari 4 beta, you've discovered the full page zoom : instead of changing the font size, Safari now zooms everything on the page, from images to buttons. This produces ultra sharp text, dreadfully pixelated images, and … ultra sharp controls ! The controls are drawn by CoreUI, a private framework new to Leopard. To draw controls at any size, CoreUI uses xml "recipes" to mix BIG pictures and PDFs. We can't access CoreUI directly, but as WebKit is open source, we can peek to see how Safari does it ! 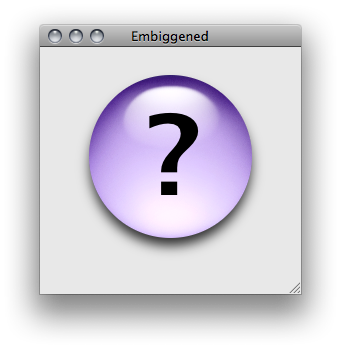 Sample Code Embiggened paints a big button. Click to cycle through button styles. A small niggle. Instead of using the rect argument, which is the region that needs updating, you should ask for the view's bounds. NSRect bounds = [self bounds]; // Now use this for the full width and height. I'm not noticing any difference between rect and [self bounds] ? What's it supposed to do ? The rect is the dirty rectangle that needs redrawing. When you resize the window and the view, the whole view needs updating. By only invalidating what has changed, and then by drawing only what has been invalidated, your drawing becomes more efficient. Picture where the user is working on some sort of elements in a view, such as selecting a range of text in a text view, or rolling their mouse over a list of buttons and having them highlight. Only a portion of the view is changing and needing to be redrawn. If you launch the 'Quartz Debug' utility that shipped with your developer tools, you can enable options to flash, or highlight, the areas that are being updated on screen. You'll see that Apple are usually pretty efficient with the amount they redraw. So coming back to the first point, since using rect is inappropriate, you should use -[NSView bounds] for finding the actual size of the view (in its drawing space). Apply has a guide on efficient view drawing if you want more information. Ah indeed when I move the view on the side to be clipped by the window, redrawing is incorrect. Adding rect = [self bounds] before Scale down drawing rect fixes the issue. Thank you !